Fundamental to the ¡VAMOS! approach is the fact that the vast majority of theEU’s inland mineral deposits are in water-bearing strata. 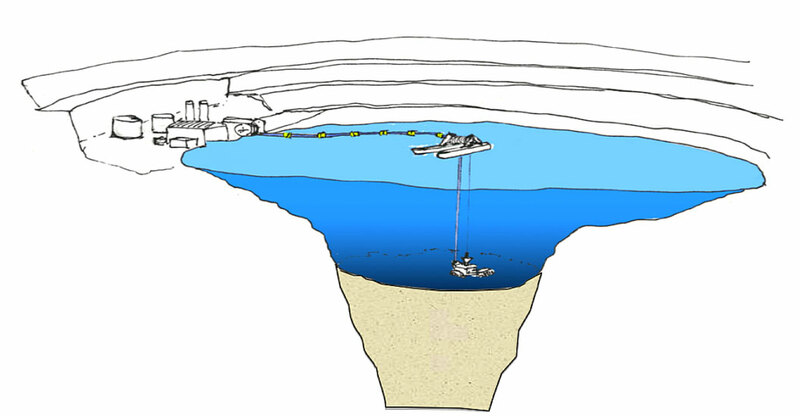 The technique involves remote operation of underwater mining equipment inland without affecting the local groundwater level. To deploy and recover the mining vehicle, interfacing the mining vehicle to the control station, pump the mining material and managing the hose and umbilical system. Umbillcal: An armoured cable with power and fibre-optic cores connecting the mining prototype to the power and control centre. Hose System: Hose and valve components used to transport the mining material from mining vehicle out of the mine as a slurry and to return water to the pit. Remotely controlled tracked miner with a cutter-head, oregathering. A pilot station to enable operation, supervision and monitoring of the mining equipment, launch and recovery equipment, floating vessel and slurry transportation system. Equipment to dewater the slurry, retain ore and return water to the pit.